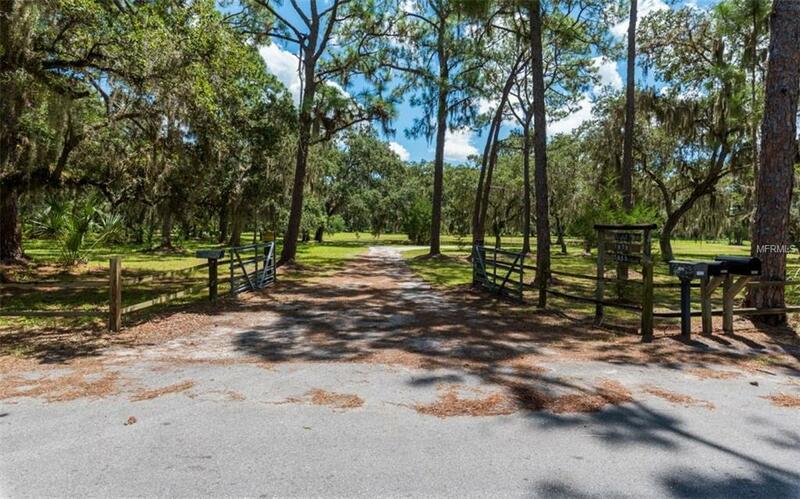 Location - A RARE FIND - 8.6 acres with Custom Home & Guesthouse in Quiet Country atmosphere, grand oak trees, pine trees, bromeliads, ferns, lilies and palms. Only ten minutes from Downtown Sarasota and arts, nearby schools, malls and restaurants. Areca palm privacy fencing along limited access road. Open floor plan designed for entertaining, with 14 foot cathedral ceiling, five by fifteen foot Butcherblock bar, over storage cabinets and pull out drawers; granite inset, granite countertops, propane gas cook top double-oven and built-in Kitchen Aid refrigerator. Double-paned windows and doors, throughout. Double French doors on north side of kitchen open to deck and underground propane gas line for grilling. Ten foot ceilings throughout and a split-zoned air conditioning system. The master bedroom opens onto a 745 square foot screened and open 100 square foot tiled porch. There is a tiled solarium dining room with six 40 x 72 north facing picture windows, with bottom open awning style. Bruce Hardwood floors throughout with two tiled bathrooms. Bathroom's counters and walk-in showers are cultured marble. Master closet has built-in drawers and craft area; Guest bedroom has built-in storage cabinets. All custom window treatments. This two-bedroom, two bath home has a covered rear porch overlooking the garden area and an L-shaped front porch overlooking the driveway and pond. The Guest House on this parcel is a small bungalow style furnished guest home with two-bedrooms, one-and-one-half bathrooms.